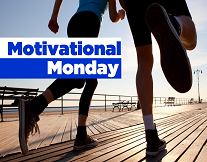 Motivational Monday is dedicated to encourage employees to live a healthier more positive lifestyle. If you have a quote that you find motivating and would like to share, send the quote to Marc D’Arcangelo at: mdarcangelo@atlanticmedicalimaging.com. Our Wellness Coordinator, Toni-Ann DiSantis offers another motivational quote to keep you inspired!